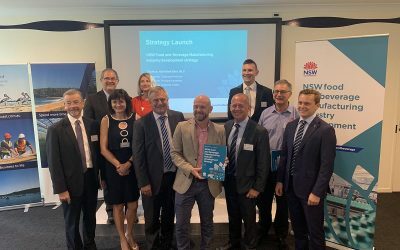 Regional Development Australia Central Coast (RDACC) today proudly hosted the launch of the NSW Food and Beverage Manufacturing Industry Development Strategy at the University of Newcastle’s Ourimbah Campus Business Incubator. Officially launched by the The Hon Niall Blair, MLC, (Minister for Primary Industries, Minister for Trade and Industry; Minister for Regional Water), the Strategy aims to encourage the state-wide development of the food and beverage manufacturing industry – NSW’s largest agribusiness sector, consisting of 3600 businesses and employing close to 70,000 people. RDACC Chair, Phil Walker said he was especially pleased the NSW Government decided to launch this important initiative here on the Central Coast. “The Central Coast is the ideal location to launch this important state-wide initiative, as we are a region with a strong history of food production, rich agricultural lands and a growing economy of food production and manufacture,” said Mr Walker. “RDACC is proud to reinforce the Key Strategic Themes and Initiatives of this Strategy –which include collaborating for commercial advantage and creating a fit-for-purpose workforce — particularly through the Central Coast Food Innovation Initiative. “As mentioned in the NSW Government’s Strategy, the Food Innovation Initiative provides a comparative advantage by leveraging our region’s existing strengths and realising economic benefit through growing and innovating our local food industry. RDACC Director of Regional Development and CEO, John Mouland, said our local food and beverage sector is an integral part of the Central Coast economy. “Manufacturing is our second highest value add industry here on the Coast, with an estimated value of $918 Million,” said Mr Mouland. “Aside from our local food and beverage manufacturing capability, we are also home to a diverse sector covering smaller artisan food producers, high quality primary food producers, as well as food service companies in catering and hospitality. Mr Walker said we should all be excited about the future of food and beverage manufacturing here on the Central Coast, around the state and across our nation. “RDACC looks forward to partnering with the NSW Government to deliver the NSW Food and Beverage Manufacturing Development Strategy throughout our region and supporting the realisation of its outcomes across the State, to the benefit of our entire population,” added Mr Walker.